I know that I talk about fashion, and fashion, and fashion; but a wonderful new friend I met tonight suggested I incorporate my love of dining culture into this blog as well. After all, I am equally passionate about amazing food since I can't get enough of it! And there really is little else more therapeutic and soul-cleansing than a brilliant night of dining with incredible people and, hopefully, incredible food. This is the first of a unique take on dining in the city through the eyes of Dylan In The City! Oliver&Bonacini's LUMA, a relatively new restaurant that opened at helm of the TIFF Bell Lightbox's famous beginnings on King St. West, is a casual yet refined escape from both the monotony and sometimes pretentiousness the Entertainment District can evoke; and it does it all with a brilliant plate of food. I spent the evening here tonight with my cousin, who was coming into the city for a day or two, and a couple of her amazing friends (who are now, I'm happy to say, my amazing friends as well). Immediately, upon entering the 2nd floor restaurant that overlooks King, we were greeted and treated in a polite, respectable, and refined manner. We were seated with prompt attention and given a chance to gather ourselves before we ordered. I should mention, before I comment on the food, that LUMA was not what I expected it to be. Commonly touted as Oliver&Bonacini (famous for restaurants of significant praise and expense like Auberge du Pommier and Canoe) under a semi-casual light, I was expecting LUMA to be decent. What I experienced was beyond that; what I experienced was brilliant. 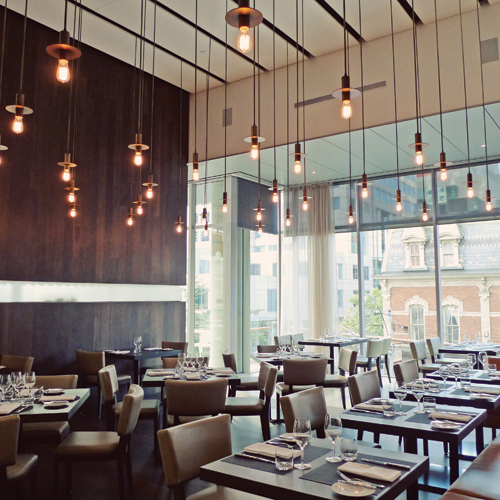 LUMA's decor is urban but refined. Warm colours and wood create an inviting atmosphere that is reflective of the urbanity of the street it sits above. It is casual enough, in this sense, to almost be a midday, bistro-esque sit-down. However, it's meticulous menu; scattered with everything from crisp, Parisian salads to warm, truffle soups; exudes a beautiful and minimalist sophistication. I ended up vying for the Ricotta Gnudi, which is the only vegetarian-friendly item on the menu. The gnudi was as beautiful as the menu itself. Fluffy pillows encased in the slightest foam of Parmesano and swimming in a creamy ricotta mixture of field mushrooms, herbs, and the slightest, effervescent hint of truffle. The gnudi was heavenly, and left a rich aftertaste that just melted my heart. It was as warm as the service, which at times was a little slow, but was made up for in the fact that it was extremely attentive, kind, warm-hearted, and respectful. I washed my wonderful pasta down with a sharp Vinho Verde, before sharing LUMA's famous Chocolate Délice (voted by Toronto Life as one of the best desserts in the city!) with my new, wonderful friends. The Délice was a rich and velvety bar of pure, dark chocolate, layered with textural elements of crisp peanuts, crunchy brownies, caramelised bananas, and perhaps the best peanut butter ice cream I've ever had the privilege of eating! 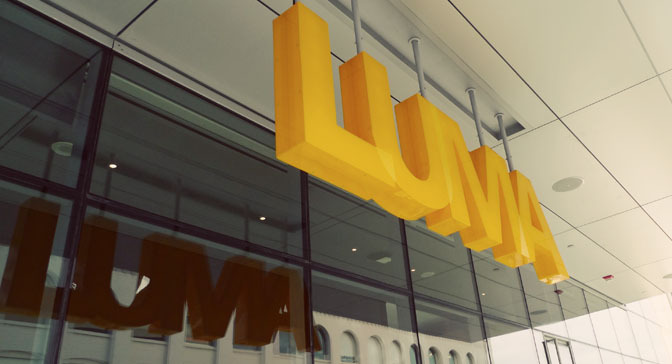 Overall, LUMA, as you've probably guessed, proved to be an unforgettable experience. 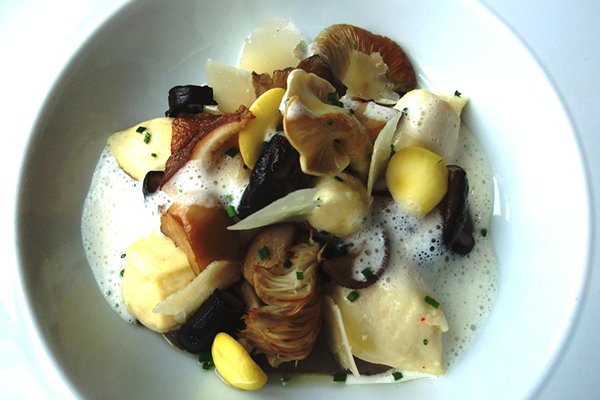 A wonderful, sophisticated dining experience that was both refined and unpretentious. Fantastic, attentive service only equalled by the quality and execution of its beautiful, subtle dishes, and perhaps only surpassed by my wonderful company! A must-experience, especially with patio-season approaching, LUMA lives up to its reputation as the cornerstone of King West's most famous endeavour, the TIFF Bell Lightbox. Cheers!